30 DayTwitter Challenge- Is Twitter a whole lot twaddle? Happy New Year folk. How are you getting on with your New Year’s resolutions? I had a year of mixed blessings last year and I am determined to have a more proactive approach to life and work. 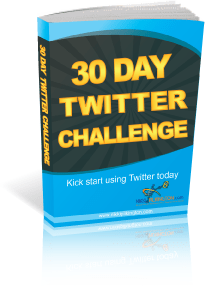 A few days ago I accepted a challenge to review Nikki Pilkington’s e-book called 30 Day Twitter Challenge . Now I am not quite sure why as Nikki is the expert and I have been her student for sometime now. When I joined Twitter in 2008, I had no clue what it was or how to use it effectively and I turned to Nikki’s 50 day email twitter course, there is an updated course here. Back to the 30 Day Twitter Challenge e-book, I found it easy to read but have not started the challenge as yet. This review is therefore based on content rather than results I achieved having undertaken the challenge. The e-book is not designed for new comers to Twitter so if you one opt for the EMAIL course it is instead ideal for folk that use Twitter for Business. The book is written in simple English and it is very easy to follow through a daily challenge. The challenges are interlinked and each is explained simply with examples and if you still don’t get you have email support via Nikki. It is cleverly designed to so you are not tempted to cheat! If you skip one of the challenges you will get stuck on the next one! So be ware! Some challenges require the use of Twitter applications and you are pointed to the best applications out there so you don’t have to find them yourself. They are tips on how to find people that want your offering, how to prospect effectively on twitter- I loved this bit as it provides examples so you avoid being seen as SPAMMER, there also tips on how to tweet in a way that allows you to develop relationship on twitter including with folk that are your competitors. There is so much contained the 48 pages and I really don’t want to give it all away here so pop over to the 30 Day Twitter challenge page and grab yourself a copy. It is a real steal at £8 as there are several articles and resources at the end of the challenge that you will find useful. And if you think Twitter is whole lot of twaddle this book will concentrate your mind! I will be taking the challenge so please come back and share your experience.